The banner, a gleaming harbinger of untold glories yet to come. 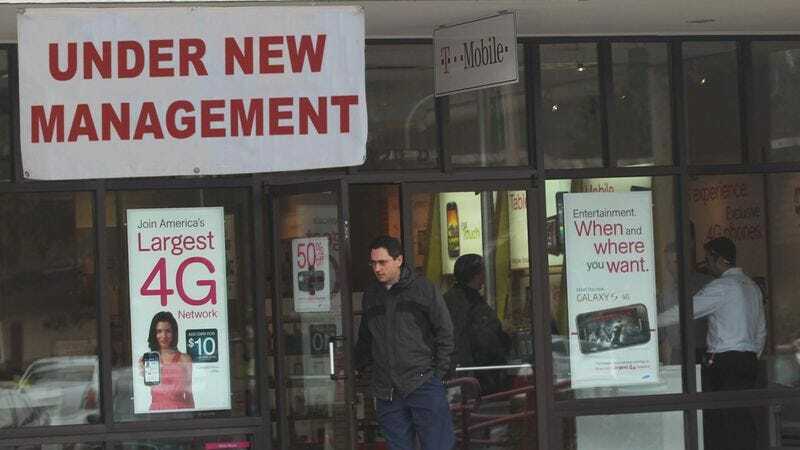 SMYRNA, GA—Foretelling a brave new epoch in Cumberland Mall T-Mobile store history, a grand "Under New Management" sign was triumphantly unfurled across the retailer's front window Saturday morning. Sources said the 2-by-4-foot weatherized cloth banner, hand-delivered one day prior by a gallant messenger clad in Pullman brown, would usher in a momentous tide of good fortune for all who come in search of fairly priced cellular phones with accompanying voice and data plans. "Yeah, we've got some new folks running the place," senior associate Mike Snyder told reporters as the first intrepid visitors, no doubt stirred by the sign's bold declaration of an emerging golden age in personal telephonic technology, crossed the store's threshold. "Anyone who's been to this location a few times might notice some changes." "Nothing too crazy," the man added with a humility belying the full splendor of the reborn Greater Atlanta area T-Mobile franchise. "Just a few tweaks here and there." As the new era of prosperity dawned on T-Mobile store 7783, members of its visionary new leadership issued their first edicts on how the 700-square-foot commercial space would be transformed into a veritable utopia of wireless sales and service. First and foremost, the freshly anointed authorities declared, would be a firm break from the shackles of the past through a purge of any remnants left from the store's tyrannical former regime, sweeping aside once and for all any trace of the oppressors who had ruled so pitilessly since 2007. "Getting rid of the center kiosk and sticking the Bluetooth headsets on the wall next to the car chargers is really going to open the place up," said morning manager Dale Isaacson, referring to the circular wooden pedestal that has since been banished to the dark recesses of history. "Now, when people come in the front door, there's finally a clear path to the 4G smartphones." "Over the next few months we'll be looking into other improvements of that nature, too," he added, offering but a tantalizing hint at the audacious lengths to which the new management would go in order to ascend to the very pinnacle of regional cell phone retailers. Standing in line at the customer service counter, T-Mobile user Sherry Akers, 39, took a moment to speculate on the exhilarating transformation unfolding, as if in a dream, all around her. "Yesterday, I dropped my phone and the screen came apart," said Akers, breathing in the precious first moments of the store's flowering renaissance. "I'm not sure what the deal with the warranty is, but I hope they can just pop it back together without my having to get a new one." What trials await these fearless new helmsmen may not be known for some time. For now, sources said, all who enter the Cumberland Mall T-Mobile store can be assured a standard of product knowledge, personal attention, and technical support unrivaled in the history of commerce. But if the lessons of history have foretold anything, they cautioned, it is that all empires—no matter how bold or enlightened the vision of their leaders—must one day fall.